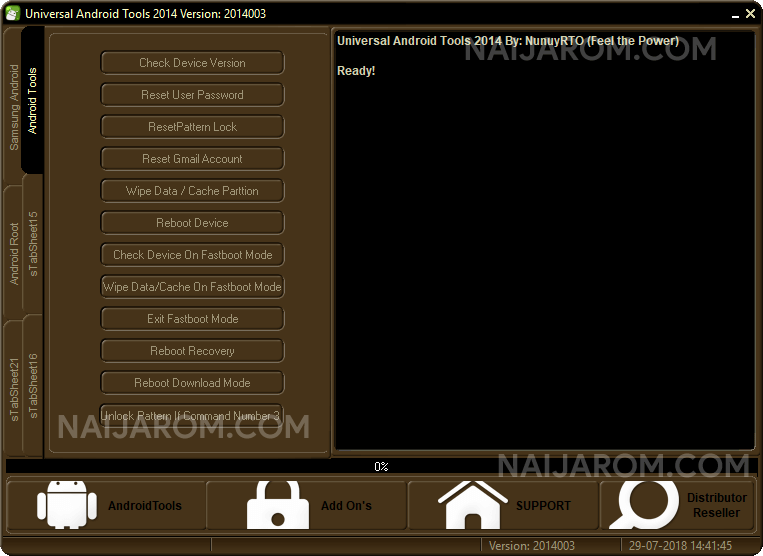 Universal Android Tools 2014 is a small application for windows computer which allows you to perform multiple tasks on your Android Device, whether you wants to Root your Android Device or removing the Pattern Lock, PIN Lock. it also allows you to check the device on Fastboot Mode, Wipe Data on Fastboot Mode, Wipe Cache on Fastboot Mode, Exit the Fastboot Mode Recovery in single click, Reboot the recovery, Reboot the Download Mode, unlock the pattern. In order to use the Android PC Suite properly, you need to install the Universal ADB Driver on your Computer. Once Driver is installed you can successfully connect your Android Device to the computer. [*] Credits: Android PC Suite v1.7.8.229 is created and distributed by NunuyRTO (developer). So, full credits goes to NunuyRTO (developer) for sharing the tool for free.